This dress was a recent eBay purchase after seeing it on Veronika's blog (here) a few weeks ago. She was so sweet to even help me with sizing info, so I could make a confidant eBay purchase (I hate when I take a chance on eBay and end up wrong). I even bought her amazing pink Kate Spade bag which surprisingly has not made it on here yet! What a shame. Soon! I was very happy with this dress when it arrived in the mail because I chose the right size and it was so soft and comfortable. 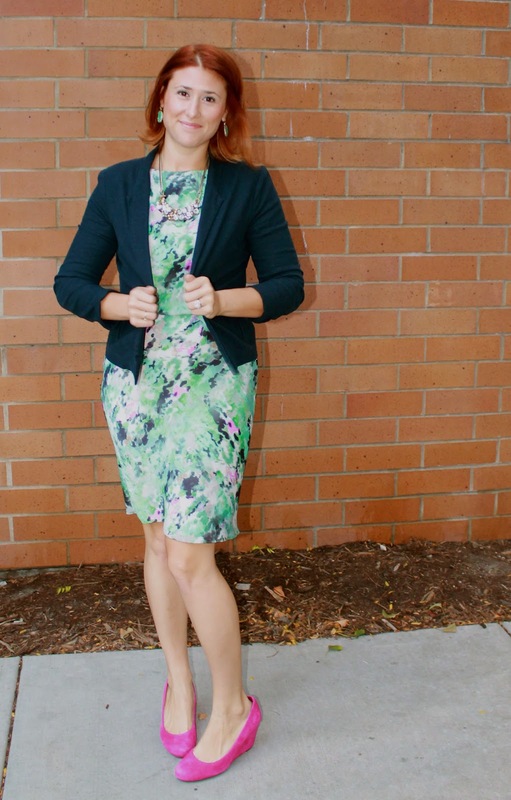 Even though it's Fall I couldn't resist wearing this very Springy print. It was just so pretty I had to do it. I see it working with black tights, boots and a blazer in winter. If you have been to Target recently, you know that they have some really great options. These hot pink suede wedges were one of them and came in so many fun colors. The pink is only available online as well as orange, purple and a few others. Check them out here. I ordered them in 3 colors just so I could pick which color(s) I wanted to keep. I must say the taupe suede were a really yucky shade of tan/brown, and those went back. But the pink ones where a pleasant surprise. They were vibrant and had a great quality look, similar to The J Crew ones I've contemplated in the past. Very comfy but ran a little big. Nothing a trip to Target for some heel grips on the way home didn't solve. The red patent ones were keepers as well! What spring/summer items do you sneak in wears of in the colder months? This is a much more accurate depiction of the color of these wedges than on the website in my opinion. Thanks girl! You know I love me some Ebay! Beautiful dress and love the shoes! Bummmed they don't have those wedges in black, I've been searching for a pair like that. For some reason they separated 3 of the colors. Hope you can snag a pair!